The A1 in Lincolnshire was closed 'for several hours today after a tanker carrying 23 tonnes of sulphuric acid overturned. At 5.02am police received a report of a single vehicle collision on the A1. 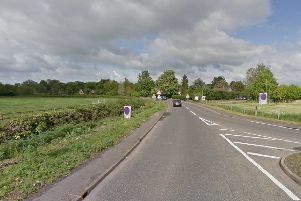 The collision involved a lorry which was on its side. The road was closed while police dealt with this collision and diversions were put in place. The road was closed between the Colsterworth Services junction and the A606 Rutland Water turn off. The road reopened in both directions at 4.45pm. Earlier, Inspector Mark Gee said: “The truck has got 23 tonnes of sulphuric acid in it, however it is fully intact, there are no leaks what-so-ever from the vehicle. The main issue was the worry that it could leak but it hasn’t at the moment and we do not believe that it will do. “The problem we are going to have is that we are going to need to recover the vehicle and that could take some time with specialist equipment being needed to complete the recovery. “So at the moment we expect the road to remain closed for some time this morning and may go into this afternoon. “There are no injuries to the driver as far as I am aware. The driver was trapped initially buy managed to get himself out.